An interesting work about nineteenth-century American religious and political history by J. Spencer Fluhman (BYU), “A Peculiar People”: Anti-Mormonism and the Making of Religion in Nineteenth-Century America (UNC Press 2012). The first major Supreme Court religion clause decision, Reynolds v. United States, was decided in 1878 and involved the prosecution of a member of the LDS Church for bigamy in what was then the Utah territory. The publisher’s description follows. Though the U.S. Constitution guarantees the free exercise of religion, it does not specify what counts as a religion. From its founding in the 1830s, Mormonism, a homegrown American faith, drew thousands of converts but far more critics. 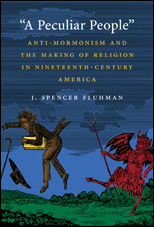 In “A Peculiar People”, J. Spencer Fluhman offers a comprehensive history of anti-Mormon thought and the associated passionate debates about religious authenticity in nineteenth-century America. He argues that understanding anti-Mormonism provides critical insight into the American psyche because Mormonism became a potent symbol around which ideas about religion and the state took shape. Fluhman documents how Mormonism was defamed, with attacks often aimed at polygamy, and shows how the new faith supplied a social enemy for a public agitated by the popular press and wracked with social and economic instability. Taking the story to the turn of the century, Fluhman demonstrates how Mormonism’s own transformations, the result of both choice and outside force, sapped the strength of the worst anti-Mormon vitriol, triggering the acceptance of Utah into the Union in 1896 and also paving the way for the dramatic, yet still grudging, acceptance of Mormonism as an American religion.